Getting in and out of a car can be difficult for elderly people or those with disabilities and restricted movement. The solution is here: A car seat that swivels and can be tilted back. 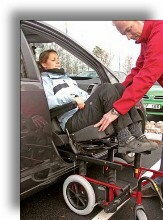 The Autoadapt Turnout concept makes getting in and out of the car much easier using an electric swivel-plate which enables you to turn the seat out over the door-opening with an easy-to-use hand control. In order to optimize movement in today’s autos, which often have angled frames or low door openings, Autoadapt has added a footrest and tilt function to its swiveling car seat so that the seat can be more easily maneuvered into the car. The Tilda tilt function was named after the young girl who was our first customer to use it. The combination of the swiveling seat and tilt function provides maximum head room for the person in the seat when it is turned in or out. With the feet placed on the footrest, there is no need to lift the legs over the door opening as the seat is swiveled into place. “When the feet are placed on the foot rest, there is no risk that the legs are pressed against the dashboard when the seat is swiveled into place”, explains Don Beattie, Marketing and Sales at Autoadapt UK Ltd. one of the largest mobility industry distributors in Great Britain and NI, as well as in Rep. of Ireland, and a part of the Autoadapt Group, an internationally leading product provider in the field of car adaptation for the elderly and disabled. The swiveling seat with the Tilda-tilt function has been specially designed for use in both two- and four-door cars. 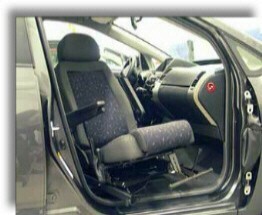 In addition, the swivel seat can be installed in the driver’s or passenger’s side of the car. Simply pull the handle to tilt the seat back 7, 11, or 15 degrees. The swivel seat has a variety of adjustment capabilities and accessories that provide the user with ergonomic, variable seating. For example, floor runner extensions allow the swivel seat to be adjusted along the length of the interior of the car or choose Autoadapt’s lower-built seat to ensure a proper seating height while allowing more room for getting in and out of the car. For people with back problems, the lower-built Autoadapt seat can even be fit with gel-filled seat cushions that are positioned to provide maximum comfort and support. The swivel seat is approved by both CE and E standards; it has been crash tested and is approved for up to 150 kg of stress. The tilt function has been through particularly rigorous testing for use upright and at a 7 degree tilt. “With the seat tilted, the ride is more comfortable since the sitting position provides more support for the body. During development of the seat, it was tested by a person with a disability that causes his head to be bent against the chest all the time. When the seat was tilted back, he could see out through the windshield of the car for the first time in his life,” explains Don Beattie. The swivel-seat and tilt functions can be installed in the car’s original anchorage points mounted in the floorboard of the car; there is minimal impact on the car so the standard equipment can be reinstalled in the car when it is time to sell it. Mounting consoles for individual car makes and models are available for most of the cars on the market.